Disclaimer: The author of this article does not intend that the information provide replace professional legal advice in any way. This article is only intended to provide a short explanation to the basic legal and business practices associated with the playing of music in a public place and public performance royalties associated within the music industry. To gain a better understanding of the law, consult a with a music attorney or music licencing agencies listed in this article before playing music in your place of business. Do I need a license to play music in my establishment? In most cases the answer is Yes! Some people think that just because they have purchased music in the form of a CD or MP3 that gives them the right to broadcast music in their place of business. In reality, when you purchase a CD, MP3 or similar product, you are granted the right to non-public performance right of the material for personal use, such as in your home or in your car. If you are using someone else’s copyrighted music, there is a moral and legal obligation to obtain their permission to do so. Although you may have paid for a copy of the music, or are paying a DJ or live band to perform copyrighted music, you are still required by U.S. Copyright Law to obtain the proper licenses for the playback of the songs in a public place. There are a number of different customer licenses; deciding which license to acquire depends upon your particular intended use. What happens if I broadcast copyrighted works without proper license? If you choose to broadcast copyrighted material without the proper licenses, regardless of how long your business establishment has done so without issue, it is very likely that you can face severe financial penalty fines and sanctions. 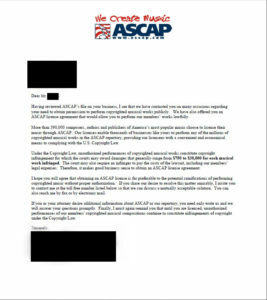 If a copyright holder or a representative (employee of one of the major performing rights organizations in the United States such as ; ASCAP ,BMI, SESAC, Sound Exchange, or Global Music Rights ) is made aware of your establishment’s unlicensed broadcasting of songs, they can hold you or your business entity liable for damages. Performing Rights Organizations routinely send representatives out to business and into various unlicensed establishments to monitor playlists for music from their repertory. Damages for such infringements range from $750 – $150,000 per song played, depending upon the usage and song in question. Such an infringement claim usually comes without warning, and many business establishments have been forced to shut their doors as the result of sudden, high-dollar infringement claims. Keep in mind that any individual suspicious of an unlicensed establishment may report it to the major performing rights organizations for review and possible financial sanctions. As such, it is always in the best interest of the business owner to obtain the appropriate music licenses. Note that you do not need to have authorized a rendition of a copyrighted song, or even have been aware of its performance, in order to be held liable. It is better, easier and most likely cheaper to be safe and license through a “Pro” commercial music service provider. Songwriters, composers music publishers and music owners generally join one of five Performing Rights Organizations in the United States that license their work to the public. Those agencies include: the American Society of Composers, Authors and Publishers (ASCAP), Broadcast Music, Inc. (BMI), SESAC, Global Music Rights and Sound Exchange . The PRO provides background music services for your business and pays royalties to the Performing Rights Organizations who then pay the owners and musicians of the music that was played at your place of business. See a sample demand letter from ASCAP shown below. StoreStreams provides streaming music for your business. StoreStreams offers a streaming music service that integrates seamlessly with your business that helps create that perfect environment for your customers and employees. StoreStreams offers retailers restaurants and business owners affordable streaming music service plans for your business that are feature rich and affordable. The latest streaming and audio technology — no discs, no downloading, no satellite dishes, no computers. StoreStreams is now available for U.S and Canadian business looking for a commercial background foreground music provider. StoreStreams is fully licensed in the United States and in Canda and pays music royalties to ASCAP, BMI, SESAC, Global Music Rights, SOCAN & RESOUND. StoreStreams is the turnkey streaming music service for your business. The Store Streams background music service is a streaming media solution that integrates seamlessly within your business environment. With StoreStreams your business has access to the best in today’s hit music and a wide ranging music catalog to create the perfect vibe for your business! StoreStreams is the turnkey background music service for your retail business. The Store Streams music service is a streaming media solution that integrates seamlessly within your retail environment. With StoreStreams your business has access to the best in today’s hit music and a wide ranging music catalog to create the perfect vibe for your retail outlet!